I thought I'd throw this out into the KB since I recently PM'd another member on this. Heres a little trick for that dent in the pipe. Fill that area with water. Wrap a towel around the dented area only and sit the whole thing outside in freezing weather, or in the freezer if you have one big enough. Ensure the dent is right in the middle of the water slug. In the morning the dent will be gone. I did this on a relatively thick steel Jardine header for my '79 Yamaha and it worked like a charm! Thanks for the tip, but I don't fully understand the process you described. When water freezes it expands about 10%. Don't i need to seal the ends of the pipe? When the water freezes on the ends it will plug them enough to hold hundreds or even thousands of pounds of pressure. What does wrapping the towel do? The ends should freeze first but the towel is wrapped around the dented area first to insulate it and ensure that part freezes last. Once the ends freeze the water in the middle will be compressed and pressure will rise enough to push the dent out. If the dent is small enough it should push out all the way on the first try. How much water do I fill the pipes? You have to fill the pipe so there is enough water to build pressure - I'd say at least a foot on each side of the dent. Too much and you *could* possibly split the pipe, so don't go all out the first try. Guys do this on 2 stroke expansion chambers all the time. I've seen this work on two stroke pipes, especially the expansion chambers, but thicker wall four stroke pipes seem to be a little tougher to do. I had a set of pipes with a dent in one of the downtubes and I tried this method. Didn't work. What I ended up doing is putting rubber stoppers in the ends of the pipes with a bracket to retain them. 5 lbs. nitrogen pressure and then got the dent area cherry red with an oxy/act torch. Dent pushed right out. Try at your own risk. These were black pipes so I just repainted after the repair. 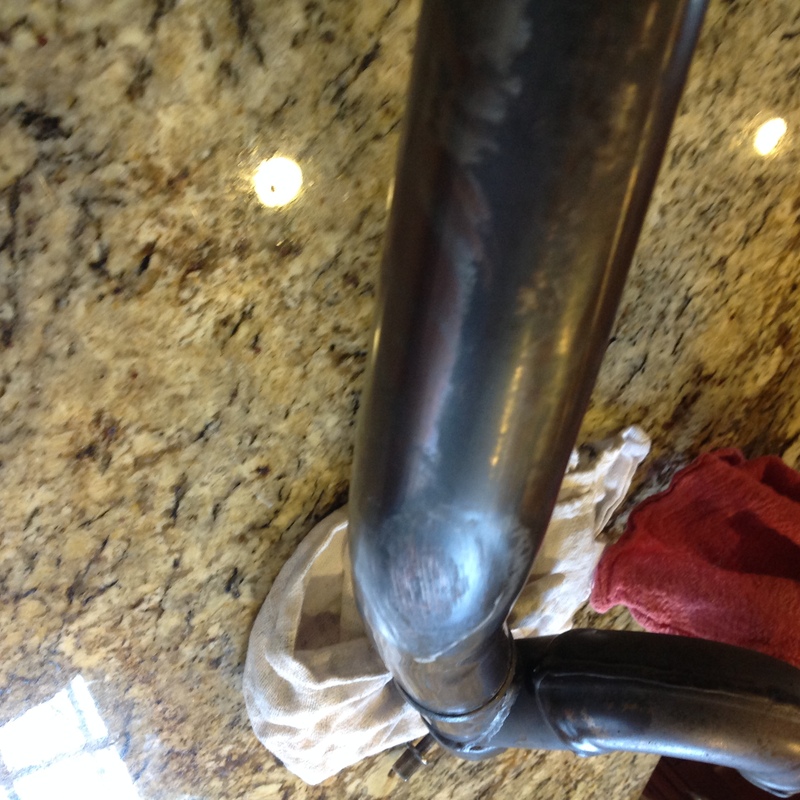 It would probably leave a nasty looking burnt spot on unpainted pipes, although you might be able to sand/polish it out. FWIW, the Jardine pipes on my Yamaha are probably 1/16" thick carbon steel and are HEFTY! I couldn't believe it worked as well as it did. You have to use enough water and it's absolutely imperative that the dented area freeze last. I cannot stress this part enough. The other thing is that almost everyone has access to water and a freezer. Not everyone has access to plugs, pressurized gas, and an oxyacetylene torch. I've tried the freezing water trick more than once on 2 stroke pipes. Usually have pretty good luck. On large dents doing it twice or more produces good results. I've heard about the same routine but with dry ice. That's how those paintless dent repair services do it from what I understand. This worked brilliantly for me. here is a link to a web album i shared with some of the boys i ride with. unfortunately in my haste to get it in the freezer, i forgot to take "before" photos. This forum is one of the coolest thing to ever hit the world. Did the throw it in the freezer trick. Well I'll be darned! What a great idea. I've got a very similar dent to yours Dan. May be one day I'll give this a try. wow! when i started reading my skeptical mind immediately judged this as hocus pocus. then all the reports of successful repairs and i am transferring this file into the "strange but true" folder. nice tip. It is amazing, and to think water is also one of the only substances that is lighter as a solid than a liquid. God's own design. I giving this a try tomorrow night when the overnight temps come back down into the freeze zone! Thnx for posting this! I did give it a try but even with temps in the 18 degree range (digital thermometer measured) the water in the pipe would not completely freeze. 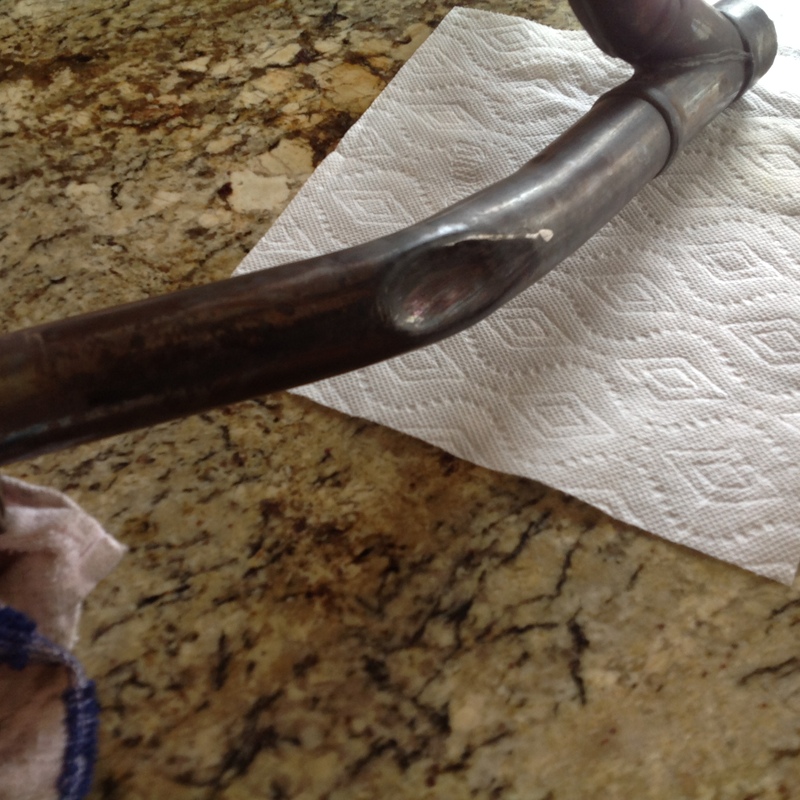 I'm thinking the carbon coating inside the pipe may have some influence. I'm on the hunt for a friend with an empty chest freezer @ 0 degrees... More later..
Yerp done this on my 2 smoke pipe. Make sure the wife is not home though. Here in the pacific northwest we don't need to ferment in a freezer. There are only about 2 months that I even have to give any thought to temperature. I do have 4 refrigerators though, and one of them actually has food in it! I'll leave that for another forum and just say.. I control fermentation temps when i brew..and I think it matters ,,It made a difference in quality and consistency when I brewed in Corvallis Or, Fairbanks AK, South Carolina, California, and now Texas...but to each his own, do what makes beer for you. Probably has nothing to do with our bikes, but interesting nonetheless. Thanks, that was a great watch. After watching that, I feel a lot better about my dented header! Does make on wonder if plugging it and heating water would work as well? I'm not really wondering, but I think you should video your attempt and have someone standing by (at a distance) to post the video here on the forum postmortem. Well said! Look up "boiler explosions" on youtube to see the result. Heating water to create pressure potentially results in catastrophic explosions, because if the pressure is released the water turns to steam and expands to many, many times its liquid volume. It would be much safer to simply use hydraulic pressure with cold water, and a grease gun or similar to generate the pressure. The nice thing about the ice method is that the ice forms the necessary perfect seal either side of the dent, before the liquid by the dent freezes and expands. So it was you that knocked it up so high! Sorry about that, mate. Not sure I'd consider $25 high though.